MELBOURNE INTERNATIONAL FLOWER AND GARDEN SHOW "WILD AT HEART"
Our design received 1st place in the Melbourne International Flower & Garden Show, Boutique Garden Competition. ‘Wild at Heart’ is a garden designed to integrate Australia’s native flora and fauna into a retreat for people to unwind and reconnect with nature. It is a conservation project bringing Australia’s unique natural environment into urban backyards; unifying rehabilitation with the opportunity for people to once again experience nature in everyday life. With the building and experience of Indigenous Design Landscaping we were able to bring ‘Wild at Heart’ to life. 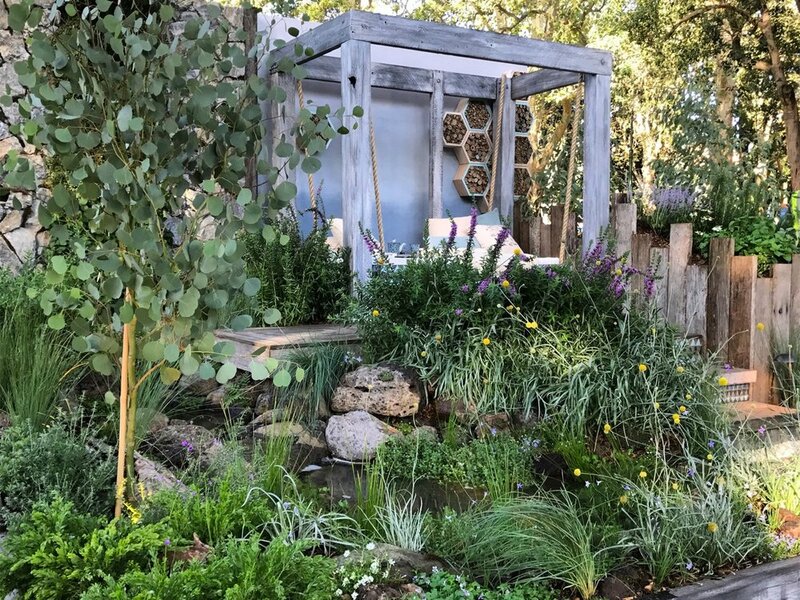 This garden was created to demonstrate that we can incorporate habitats, homes and systems for all species, that our native and indigenous plants can be a beautiful addition into our gardens, and how a natural system can help maintain the function of your garden. The garden consisted of a water plant vertical wall garden, nestled in between a moss growing rock wall, where the water naturally cooled the air as it trickled down a into a pond that winds down past the recycled timber deck to where native frogs provided a wonderful symphony of melodic tunes amongst the flowering water plants. It is where misshapen stones and boulders provided homes for skinks and geckos to feast on the insects that are drawn into the garden, and where native bees and insects pollinate the numerous native flowers and edible plants. It is very important to think about how we can include homes, habitats and native plants into our lives and by doing so we are privileging our native Australian plants and animals, thus reducing invasive populations.